When I was born, I was very young. So, back then, I could be forgiven for not knowing everything about everybody. But, I shared a room with my sister. I should have learned a thing or two about her. I hardly know her at all. For instance, I never knew she was a big fan of Star Wars. 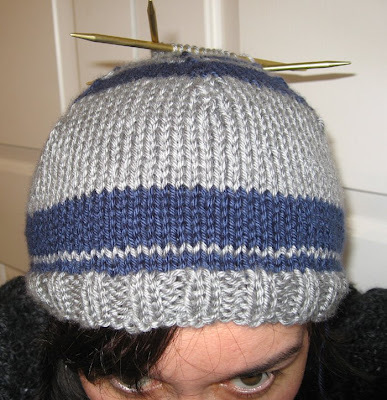 I was surprised when she asked me to knit her an R2D2 beanie. The hat is nearing completion, but I’m worried it will be too big. My sister claims to have a big head. I know I have a fat head. The hat’s a little loose on me. So, which is bigger? A bighead or a fathead? 7:37 p.m. addition: After knitting and thinking some more, I've decided that a fathead is bigger, which means I need to make the hat smaller. I ripped the beanie out.